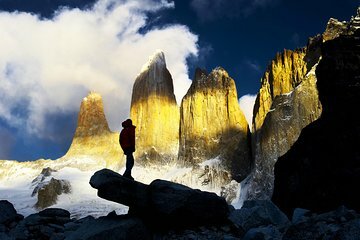 A challenging hike along the slopes of Mount Almirante Nieto is rewarded with unbeatable views of the Cordillera Paine on this trekking tour in Torres del Paine National Park from Puerto Natales. Your guide keeps you energized and motivated as you hike through the backcountry en route to a glacial lagoon where you can rest, eat, and admire the views before heading back to Puerto Natales. Holy cow, this experience was hard. I was picked up at my Airbnb without problem. The ride to the trailhead is about 1.5 hours from Puerto Natales. As I had described to my friends, hiking Torres del Paine is like going through menopause. It started out hot. Then it go windy like seriously windy like you're in the middle of a storm. Eventually as we advanced higher in altitude, it got colder. When it rained, it became freezing. The hike itself roundtrip was about 6 hours total and a distance of 10 miles. It was shorter than it normally should be because the weather got too dangerous to advance to the vista point to see the W. It was disappointing that after all that hard work, we were not rewarded with what we came to see, but at the same time, I was relieved. The terrain was difficult. The combination of snow, mud, and rain made the trail slippery and difficult to walk in. Be sure to wear waterproof hiking boots that will do an okay job in the snow. Also, the weather changes quickly in the mountains. I wish I brought a rain poncho because by the time I got back to the van, I was drenched from head to toe and had to entire a 2 hour ride back in my wet clothes. Thank goodness the heater was on, but still, it was not fun to endure. Overall, the challenge was a beautiful experience. Gorgeous views will surround you as you torture yourself on these mountains. I definitely don't regret it. If I had to change one thing, it would have been to bring a rain poncho with me. Also, I wished the weather conditions would've made seeing the W possible. I hope you all have better luck!